A pair of Eastern Phoebe's had built a nest under my deck. In the nest was a few of their own eggs and one that was very different, it was a cowbird egg. As some of you know, cowbirds are a well know egg dumper (parasitic brooder). They lay their eggs in other birds nest and have them raise them. The chicks have all fledged including the cowbird chick. 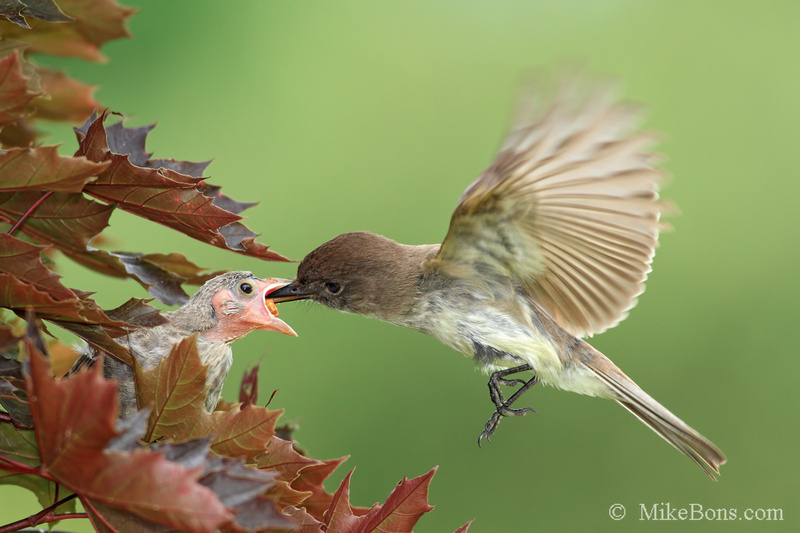 This image is of the Eastern Phoebe continuing to feed this cowbird chick. They pretty much go non stop keeping this chick fed as the chick is now bigger than the Phoebe. This images was taken with the the camera on a tripod, manually focused on the chick and trigger via triggertrap in Wifi mode using a iphone and ipad.. I was able to trigger the shutter from several yards away. JAS_Photo and ewaizel like this. I might darken in a subtle vignette way, from the top middle edge until the right corner and then down halfway. I'd go in on a feather brush maybe 1-2 inches. aside from that niggliness...awesome - frame it! What a fascinating story and brilliant shot. What an amazing shot. Beautifully executed! Just simple perfection Mike. Love this one. Thanks for explaining the background. What a fantastic nature story and beautifully composed image to boot. That is wall worthy for sure!